Faculty Change Agents: As you make your travel plans, please remember that the workshop will begin on Tuesday, June 19, 2018 with a reception at 5:00 pm and dinner at 6:00 pm. The workshop will conclude at 5:30 pm on Friday, June 22 after the closing session. Travel days for the Change Agents are Tuesday, June 19 and for most, Saturday, June 23, although some may choose to depart on Friday evening after the closing session. Campus Administrators should plan to arrive in Albuquerque in time for the opening reception at 5:30 pm on Wednesday, June 20 and stay through the late afternoon on Thursday, June 21. Administrators are welcome to stay for dinner and overnight on Thursday, June 21. The SAGE 2YC project will cover your travel expenses (economy air fare and economy parking at the airport or mileage if applicable). We can book your flight through our travel agent or you can make your own flight arrangements. If you choose to book your own flight, we cannot reimburse you until after the workshop takes place. It usually takes 4-5 weeks for reimbursements to be completed after all the necessary paperwork has been received, so it is advantageous for you if we book your flight. If you choose to book your own flight, please be sure to choose an economy fare. If you are driving to the workshop, we can reimburse your mileage. Please note, if you choose to drive to the workshop and your driving expenses exceed the cost of an economy flight, we will only be able to reimburse you up to the cost of the economy airfare. The Albuquerque International Sunport (ABQ) is the closest major airport. Please note Southwest Airlines does provide service to the Albuquerque airport. The hotel offers a complimentary shuttle to and from the airport. When you arrive at the airport you can call the front desk at 505-247-3344 to request the shuttle. They will give you directions about where to meet the shuttle. Please visit the front desk to arrange for the shuttle to take you back to the airport. If you are traveling by car, the hotel offers parking for $6.00 per day in the hotel parking lot based upon availability. Workshop participants will be staying in single rooms at the Doubletree by Hilton Albuquerque. Hotel check-in is at 3:00pm and check-out is at noon. Depending on availability, the hotel may allow you to check in early if your room is ready. If you arrive early, you can inquire at the front desk to see if they are able to accommodate you. If your room is not ready, the hotel will hold your luggage at the front desk until you are able to check in. There will be complimentary wireless internet access in our meeting rooms. The hotel offers complimentary wireless internet access in the sleeping rooms if you sign up for Hilton's Honors Points. You can sign up at the front desk when you check in and it is free to sign up. If you choose not to sign up for Hilton's Honors Points the cost is $4.95 per day for standard wireless internet access and $6.95 per day for premium access. Albuquerque in June often has highs in the 90s with lows in the 60s. There is very little humidity. Dress will be casual during the workshop. Please be prepared for cool air-conditioned buildings and hot outdoors. Please bring a laptop computer and water bottle. We will not be providing bottled water. Breakfast is provided at the hotel. They offer a full breakfast buffet at the ICON Restaurant in the hotel. Lunches and dinners will either be catered, at a nearby restaurant, or on your own. All meals will include vegetarian offerings. Please provide information on the registration form if you require special meals. We expect to be able to satisfy most food preferences and restrictions. Reuse: This file is licensed under the Creative Commons Attribution 3.0 Unported license. Albuquerque, New Mexico's largest city, sits in the high desert. Its modern downtown core contrasts with Old Town Albuquerque, dating to the city's 1706 founding as a Spanish colony. Old Town is filled with historic adobe buildings, such as San Felipe de Neri Church, 5 museums, and shops selling Native American handicrafts. Nearby, the Indian Pueblo Cultural Center provides a rich exploration of the area's Native American history and culture. In addition, Petroglyph National Monument is less than 10 miles from our hotel. Albuquerque lies in the Albuquerque Basin, a portion of the Rio Grande rift. 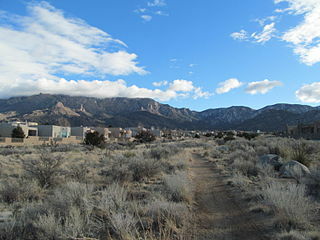 The Sandia Mountains are the predominant geographic feature visible in Albuquerque. "Sandía" is Spanish for "watermelon" and is popularly believed to be a reference to the brilliant coloration of the mountains at sunset: bright pink (melon meat) and green (melon rind).